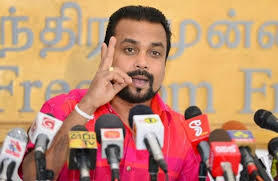 National Freedom Front leader and Colombo District Parliamentarian Wimal Weerawansa, who has been remanded since January on a charge of misuse of state vehicles and causing a loss to the tune of Rs.91,600,000 yesterday launched a hunger strike, demanding his release from the Welikada Prison. The former JVP strongman has informed the prison authorities in writing about his hunger strike. The bail application submitted on Weerawansa’s behalf by his lawyers was rejected by the Colombo High Court on Monday.